chalk rendering in Chicago, possibly in 1931. With winter snow and rain storms in full force across the world this week, it seems appropriate to post this chalk drawing by my great-aunt “Detty,” Benita McCormick. The back of this portrait contains no information to date it, but it resembles Aunt Detty’s artistic style during the early 1900s. If you look closely, you can see the outline of the thin brown wooden frame that held the portrait for decades until it fell apart in the late 1980s. The writing in the lower right hand corner of the picture is barely visible, but there seems to be a number, possibly “’31,” which could indicate that Aunt Detty drew this in 1931. 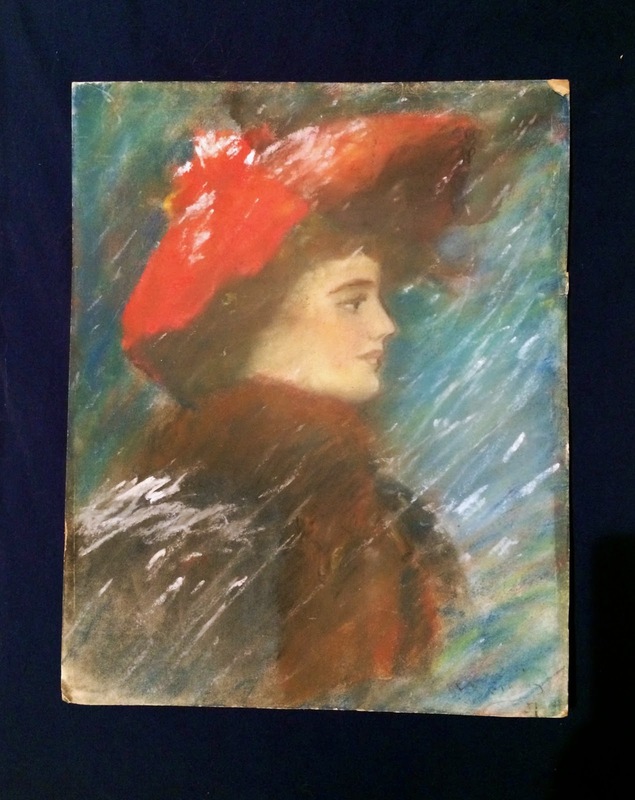 The picture is untitled, as far as I can see, but I call it the “Lady in Winter.” On the back you can see that my aunt purchased the art board at a Chicago art supply store for 75 cents. Aunt Detty’s daughter, Jane (McCormick) Olson, gave me this picture in the mid-1980s. I took it out at Christmastime to display on my antique dresser, across from a table lamp that also belonged to Aunt Detty and a small statue from one of her travels. 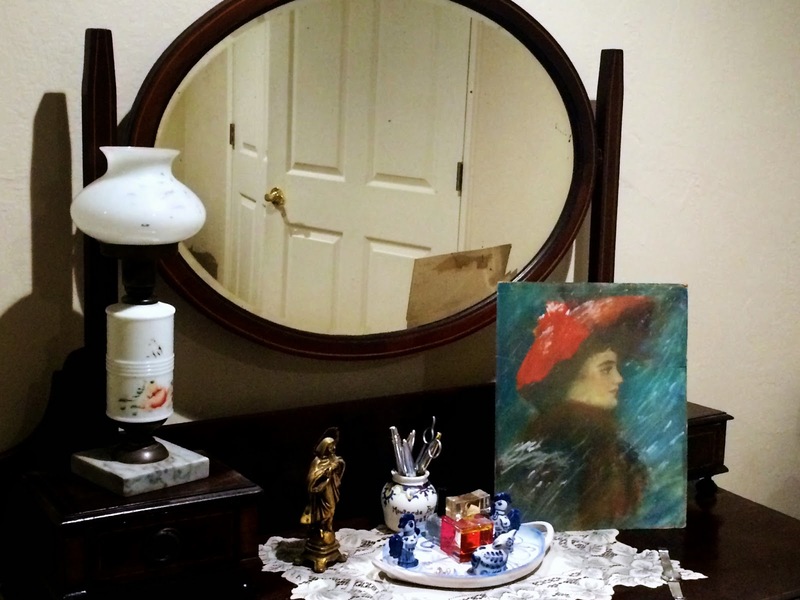 antique dresser, a reminder of an elegant and gracious era. This “Lady in Winter” looks quite content here, dressed fashionably in her red wide-brimmed hat as a stray lock of her gathered-up hair catches the wind. A matching thick red scarf gently drapes around her high neck, falling softly over what looks like a fur coat so typical of middle class midwestern ladies at the time. A steady snow swirls around her as she serenely yet confidently makes her way down the street against a stormy sky, just before dusk. Her lips slightly pulled back into a near-smile, she looks straight ahead as if anticipating a pleasant event or meeting. It is easy to imagine her warming up the room when she walked in, turning heads with her fine features and rosy countenance. She is, the more I think of it, rather a lot like Aunt Detty. Where is she going? Who is she meeting? Only she knows. What I do know for sure, though, is that the Lady in Winter cheers me up every morning as she sits there on my dresser, reminding me that no matter what weather lies ahead, it is one’s light from within that warms the heart and cheers the soul.